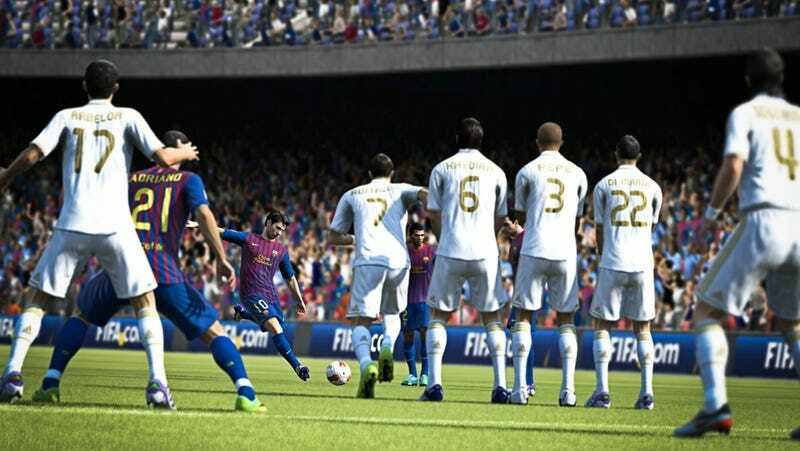 Touchscreen shooting, passing, tackling and free kicks lead the list of GamePad-specific features for FIFA 13's Wii U version, which Official Nintendo Magazine has published in its latest edition. Touching the GamePad screen will tell your players who to mark or tackle and where to pass the ball. You'll also be able to place your shot on goal by either shaking the controller or clicking the left analog stick, which will bring up a representation of the goal. Touch which corner or side you want to shoot on and your footballer will attempt to put the ball there. The PS Vita version of FIFA 12 had a somewhat similar feature using the device's back touchscreen, which won applause from sports fans and non-sports fans alike. For free kicks, players will use the GamePad to see the shot setup from the perspective of the player taking the free kick. So, they'll raise up the GamePad, use it to aim the shot and look around the pitch at where their teammates are and how the wall is aligned, before setting the amount of spin they want to put on the kick and then firing away. FIFA 13 for Wii U does not yet have a release date because the Wii U itself does not yet have a release date.